At Wesley, we believe that every student has the capacity to learn, grow and improve. To ensure students are continuing to make gains, each child is supported to reflect on their work and achievement, plan goals and work to achieve them. Additionally, they are encouraged to actively respond to teacher feedback and connect with their parents as part of an ongoing improvement cycle. 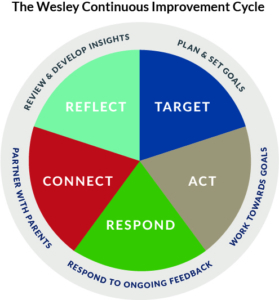 The notion of continuous improvement is embedded in the Wesley Capabilities (the 7Cs) and is crucial in developing students’ life skills, including a love of learning, discipline and positive engagement. Most importantly, it encourages students to be self-directed in their learning and strive to be their personal best. Continuous improvement occurs constantly on both large and small scales. For instance, students improve each day in the classroom by reflecting, goal setting and responding to feedback. They might set targets after a class activity or assessment task. Students also reflect, set goals, respond to feedback, connect with their parents and review their achievement after longer periods such as a semester reporting period or unit of work. The ongoing nature of continuous improvement is part of every child’s learning experience. Teachers play a key role in facilitating continuous improvement processes in the classroom. To do this, they may implement data, goal setting, assessments, self-reflection, digital feedback, reporting, effort grades, collaborative planning, parent interviews, open classrooms, Student-Led Conferences and learning journeys. These processes foster the improvement cycle for every child. Though a teacher’s role is critical to the improvement cycle, students have an active part to play in their own learning. The aim is for every student to embrace opportunities to grow, be motivated to succeed and actively participate in every learning experience as a self-activating learner. Parents also have a role in embracing both student setbacks and achievements as part of the continuous improvement cycle. So, what is the College doing to encourage continuous improvement for students? This year, students have continued to utilise ‘I Can’ statements to develop learning goals. They are made visible in classrooms and are regularly reflected on. Digital feedback has now been introduced in the Junior School. Staff have worked hard to retain the informative features previously included in Portfolios and Work Sample Folders, transitioning this feedback on student performance to a digital format utilising the Schoolbox platform. Nine hundred and fifty-five pieces of individualised feedback have been provided for parents to date. In addition, staff have engaged with consultant Kylie Bice from Growing Up Greatness to further develop their skills and understandings of data and how it can be analysed and best used to inform teaching and learning programs in each and every classroom. This work has included the introduction of new methods for gathering data and the refinement of the Differentiated and Responsive Teaching (DART) model to ensure the academic needs of all students are catered for and that continuous improvement continues to be fostered. Within the Middle School, students have been given opportunities to connect with their learning and set SMART goals, self-reflect on their own effort rating (with a comparison from their tutor), participate in Student-Led Conference, respond to digital feedback and submit pieces of work in their assessment folders. SMART Goals – at the start of the year, students develop smart goals with their tutor. These are then reviewed and reflected upon. Effort rating – Leading up to SLC, students complete a self-reflection on their effort by rating themselves on a rubric. This is done by their tutor teacher, allowing for discussion and comparison. Student Led Conference (SLC) – within a meeting at the end of Term One, students, parents and tutor teachers meet to reflect on the start of the year, goals, effort and learning. Online digital feedback & assessment folders – using assessments and rubrics to review assessments and set goals. Assessment feedback can be online on Schoolbox or within assessment folders, both for parents to see. In the Senior School, the GROWTH coaching model has been adopted to foster student self-reflection and goal setting across all year groups. Accompanied with the introduction of interim effort grades in Term 1, each mentor has connected with students to review achievement, set quality goals and follow-up on progress. Classroom teachers continue to provide ongoing digital feedback available to both students and parents. Parent interviews will take place in the coming months to ensure teachers, students and parents are partnering together and in Term 3, parents will be invited to meet with their son’s mentor to review end of semester reports, progress towards their GROWTH goals and make informed decisions about future academic pathways. Wesley remains committed to continuing a strong academic focus. Our teachers work hard to engage students in learning and use deliberate processes that promote continuous improvement for all. In doing so, they are preparing students to become the best versions of themselves and successful global citizens. Read more: Four lessons you can teach with a leaf! Four lessons you can teach with a leaf! Today marks the start of Autumn here in Perth. After a long, hot summer it’s a relief for all of us. Well, all of us who don’t have deciduous trees dropping endless leaves in the garden. But, as you find yourself suddenly surrounded by nature’s debris why not seize the moment to use it as a teaching opportunity for your child?